Managed Power over Ethernet Industrial managed switch, 24 PoE Plus ports and four Gigabit Ethernet combo ports, IEEE 802.3af and IEEE 802.3at compliant. 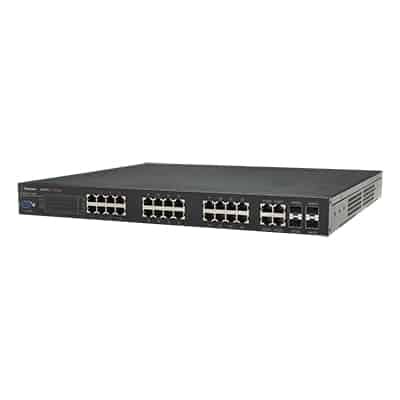 The RocketLinx ES7528 is a fully 802.3at compliant PoE Plus rack mount switch that features 24 10/100BASE-TX Ethernet ports and 4 Gigabit Uplink/SFP Combo ports. This switch is designed for highly critical PoE applications such as real time IP video surveillance and wireless communications systems. All of the fast Ethernet PoE injector ports can deliver 15.4W by IEEE 802.3af or 30W by the latest high power PoE IEEE 802.3at standard. This flexibility makes the ES7528 the perfect solution for upgrading existing video network infrastructures to a powerful IP video surveillance network. The 4 Gigabit Ethernet ports provide high speed uplinks to higher level backbone switches while advanced ring technology enables the ES7528 to aggregate up to 12 fast Ethernet rings and 2 gigabit rings providing high quality data transmission with less than 5ms network recovery time. To ensure traffic switching without data loss and blocking, the ES7528 provides a 12.8G backplane with integtrated non-blocking switching function. 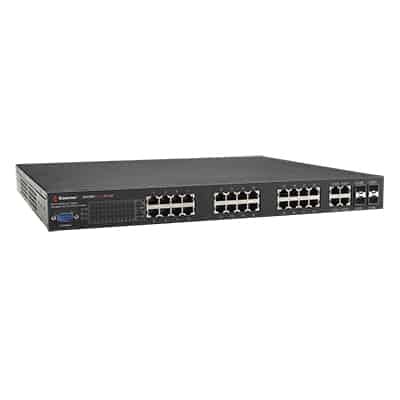 With advanced Layer 2 management features including IGMP Query/Snooping, DHCP, 255 VLAN, QoS, LACP, LPLD, and 24 PoE Plus ports, the RocketLinx ES7528 stands out from other PoE switches as the optimal solution for high density PoE and video surveillance applications. RocketLinx® ES7528 Quick Install Guide Quick guide to installation and configuration information.